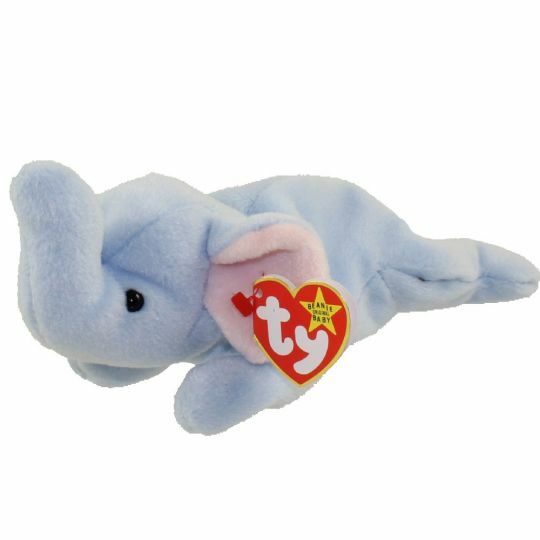 Peanut is a light blue elephant with black button eyes and a long trunk. She has two large ears either side of her head with peach coloured material for the inner ear. She also has a tiny knotted tail. Peanut is a friend you won’t soon forget! Peanut was released on 1st October 1995. Her Birthday is on 25th January 1995. This is the second version of Peanut. She was first released in a Royal Blue colour and was later produced in a pale blue. The Royal Blue version is considered very rare. She was retired on 1st May 1998.